Following two consecutive years of decline, global industrial controls (combining PLCs and DCS) registered an uptick in growth in 2017 to reach over $23.7bn. The result was a welcome relief for vendors who’ve suffered in recent years as a result of low oil prices and sluggish industry demand. But who were the leading vendors and how have their positions changed as the market has evolved? And how did the PLC and DCS markets perform respectively in 2017? Below are the global market shares for the leading providers of PLCs in 2017, following more than six months of primary research with vendors. The figures include revenues from smart relays, compact PLCs, modular PLCs and high-end modular PLCs; as well as associated PLC software and PLC services. 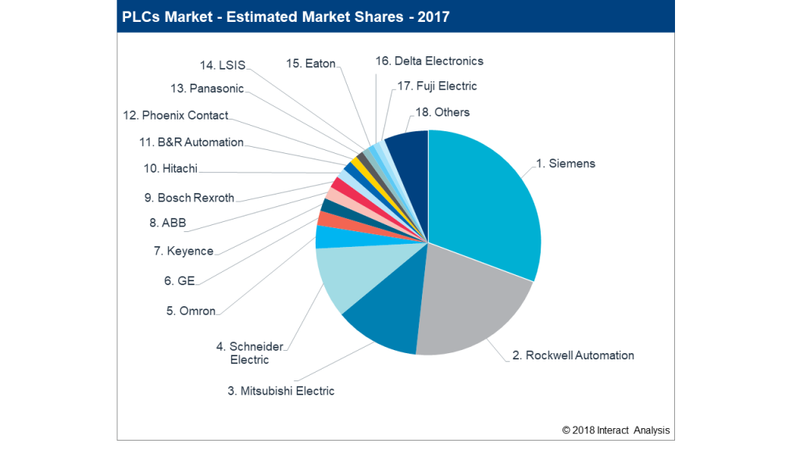 Siemens and Rockwell Automation (who accounted for >50% of the market) have held a dominant share of the global PLC market for countless years now, each being leaders in their home markets of Europe and Americas respectively. Mitsubishi Electric regained the 3rd spot in 2017 after falling behind Schneider Electric in 2015. Strong demand for compact PLCs as well as a more favorable $/Yen exchange rate bolstered Mitsubishi’s position overall. Beneath the top four is a long list of companies who each command between 1 and 4 percent of the global PLC market. ABB’s acquisition of B&R Automation would give the combined company a share of more than three percent, placing it roughly equal in size to Omron. (One might expect their position to be higher, but the scope of our research excludes industrial PCs, where B&R Automation has considerable strength). ABB Retains Its Leading Position in DCS – But Only Just! 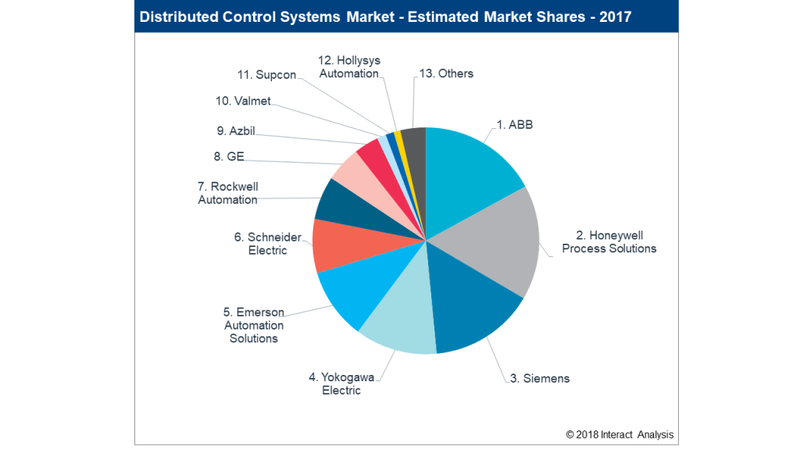 ABB continued to be the leading vendor for DCS in 2017, although Honeywell has gained share in the past two years and is now challenging for the top spot, being within half a percent of ABB’ share. Whilst both ABB and Honeywell’s DCS businesses have suffered overall due to subdued investment in oil & gas, Honeywell has outperformed its peers to gain share overall. Siemens’ share, as the third largest DCS vendor, has remained stable for the last few years – as its products are more-heavily targeted towards the chemicals, petrochemicals, pharmaceuticals and power industries rather than oil & gas. Although the top 6 suppliers of both PLC and DCS accounted for roughly 80% of the respective revenues, the DCS market remains much more consolidated with fewer players active globally. Considerable variation in market growth was seen for PLCs versus DCS in 2017. For PLCs, healthy annual growth of seven percent took the market to just over $9bn for the first time since 2014. Whilst for the larger DCS market, growth of barely one percent increased the market to $14.7bn, still some way short of its 2014 peak prior to the slump in oil price. PLC growth in 2017 can be attributed to the improved global economic outlook and performance in many key industries. It was also driven by a surge in China’s investment in automation equipment – a result of the manufacturing industry upgrading and restructuring with the desire to improve efficiency and become even more competitive on the global manufacturing stage. Interact Analysis will shortly be publishing a new report examining the market for industrial controls (PLCs and DCS) and I/O modules. The report’s primary author, Tim Dawson, is a known industry expert, having published multiple studies on these topics over the last two decades. The results of the study have derived from extensive vendor research over a period of more than six months. If you’d like to learn more about the report or have any questions, please contact us at: info@interactanalysis.com. Interact Analysis > Intelligent Automation > Industrial Automation > Who Were the Leading Vendors of Industrial Controls in 2017?